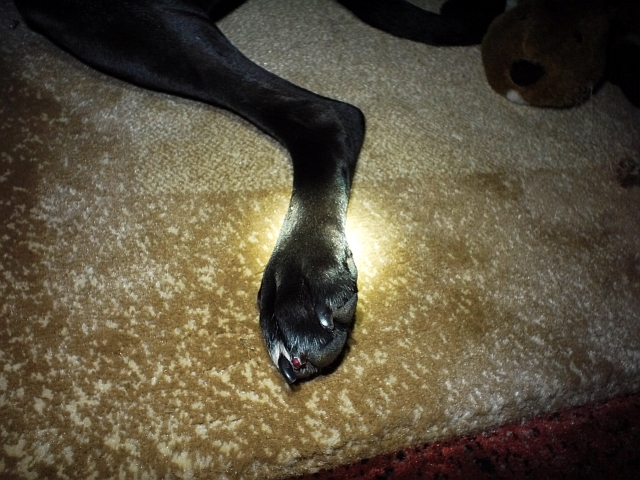 Our little boy suffered an unfortunate nasty torn toenail on his right hind foot during his trail run a few days ago. The nail appeared to be severed cleanly with no fragments hanging, but the "quick" was clearly exposed. Oddly enough, Fry never yelped or cried or gave any signs of being hurt at all. In fact, had I not noticed him licking substantial amounts of blood off his foot once we arrived back home, his behavior otherwise would never have indicated what I would have expected to be a very painful injury. On the advice of the veterinarian, we initially treated it with twice daily dilute Betadine cleansing along with oral antibiotics. The wound surprisingly didn't seem to be really bothering Fry at all and there were no nail fragments needing to be trimmed off, so careful monitoring and home treatment were recommended. 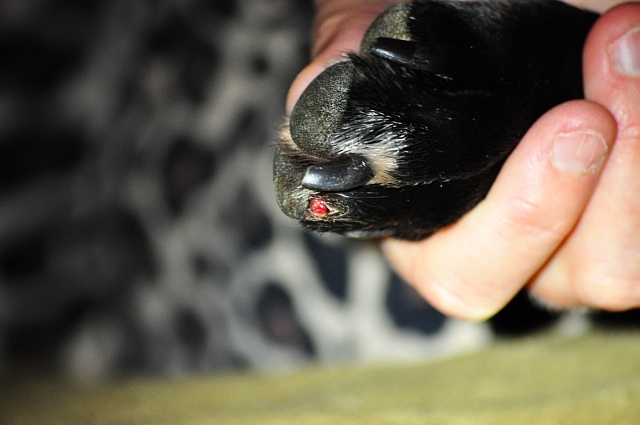 However, within a couple of days, Fry began licking and worrying the toe and the "quick" started appearing raw looking and seemed to be getting more irritated. As a result, Fry will be heading to the hospital for an inpatient day procedure this week to surgically remove the irritated "quick" under anesthesia in an effort to try and relieve his pain, ward off infection, and speed up the healing process. Hopefully our little furbaby will be back to his old self and feeling better soon. Happy Valentine's Day - To Me!